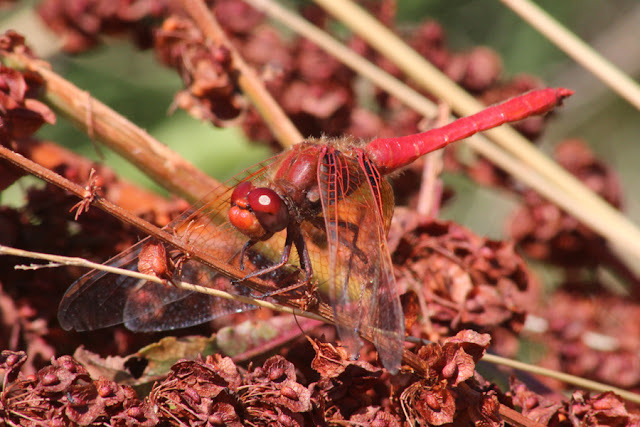 Do you have trouble identifying Cardinal Meadowhawks (Sympetrum illotum)? I think the common sentiment is that all meadowhawks that are ridiculously red are Cardinals. I like those odds, but why commit this "cardinal sin" when other diagnostic features are easily seen? 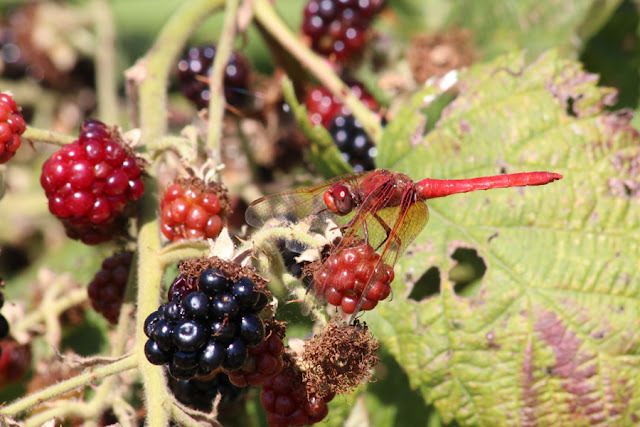 After all, we have Red-veined (S. madidum) and Saffron-winged Meadowhawks (S. costiferum) to consider within the narrow range that Cardinal Meadowhawks are found in British Columbia. The former is considered the most similar and therefore hardest to distinguish. Even then, I will show you some features that make the task of identification very manageable. To reemphasize my statement above, Cardinal Meadowhawks are redder than your average red! I photographed several on the Labour Day weekend around one of the reservoirs at the Vantreight bulb fields and took the time to focus on documenting some of the diagnostic features of these flashy dragonflies. I'll start with a standard shot just to illustrate how intense the red is on a typical male. You might want to wear protective goggles! Red eyes, red face, red wing veins, red thorax, red abdomen... even it's naughty bits are red! I hope that wasn't anticlimactic. If it was, just pretend this is actually what you saw. Enhanced for those who are easily disappointed! In my opinion, they truly are the reddest of the local meadowhawks. This does not always hold true, however, as males can fade later in the flight season and females are typically orange-brown to red-brown. Consequently, it is best to use reliable features that do not change over the course of their adult life. The best starting place is the easiest feature to see and it quickly pushes other candidate meadowhawks out of the way. At the base of the fore- and hindwings of a Cardinal Meadowhawk, many of the cells are suffused with black. 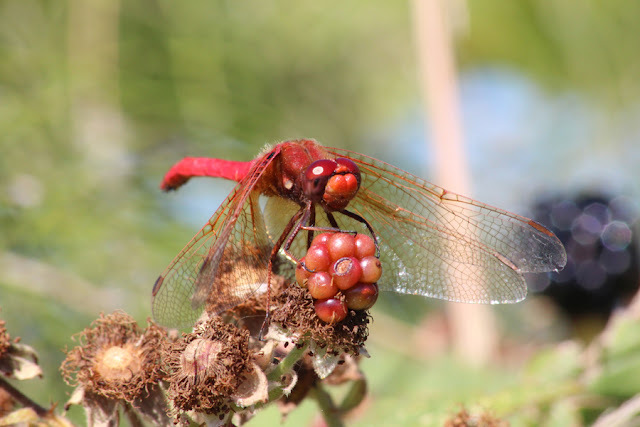 Once you know this feature and start looking for it, you can quickly assess whether you're seeing a Cardinal Meadowhawk or one of the two other similar meadowhawks. Another feature that I haven't had a chance to fully explore is the leg colour. 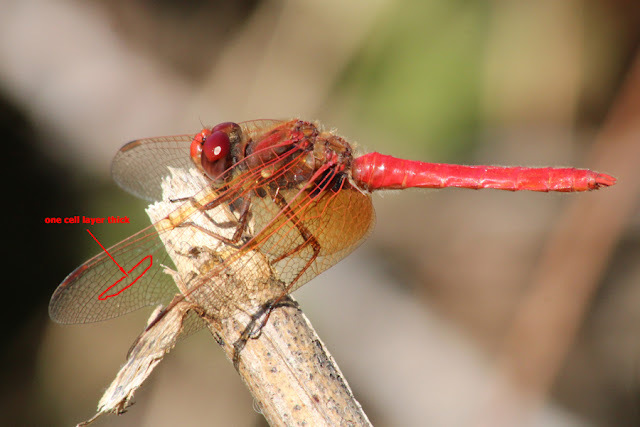 Cardinal Meadowhawks have red-brown legs whereas Red-veined Meadowhawks have black legs and the dorsal surface of Saffron-winged Meadowhawks' legs are black. As you can see on this Cardinal Meadowhawk, several of the basal wing cells contain black and the legs are red-brown. Even at a distance, the black can still be seen in the base of the wings. As a result, this feature is a quick and easy way to eliminate both Saffron-winged and Red-veined Meadowhawks. There is another feature that can be used to separate Cardinal Meadowhawks from Red-veineds, but does not work to eliminate Saffron-wingeds. The radial planate has only one row of cells in Cardinal Meadowhawks and two rows in Red-veineds. I have pointed out the location of the radial planate and traced around it to show the extent. 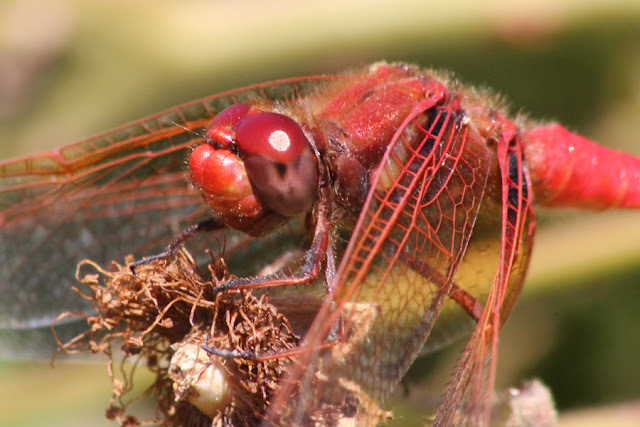 The highlighted radial planate of this Cardinal Meadowhawk's forewing consists of a single row of cells. Last year I photographed a Red-veined Meadowhawk and put the photo up here, and you can also note the lack of black suffusion in the basal area of the wings. Since I added an extra mark to eliminate Red-veined from Cardinal, I will mention a feature that separates Cardinal from Saffron-winged. 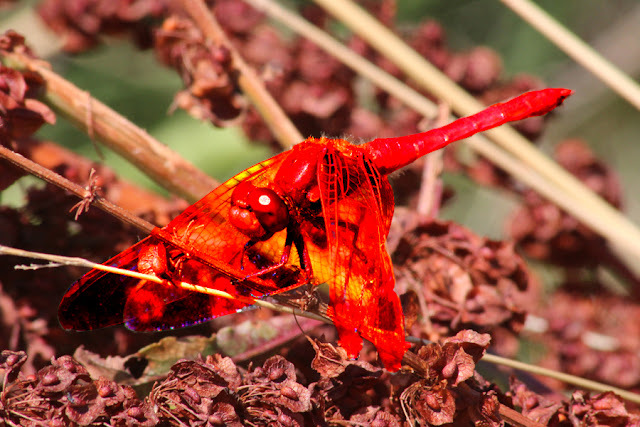 Saffron-winged Meadowhawks have a fairly uniform thorax with no obvious marks, while both Cardinal and Red-veined Meadowhawks possess two spots on each side of the thorax that are white to pale yellow. This angle shows one of the whitish spots on the thorax of a Cardinal Meadowhawk, which Saffron-winged Meadowhawks lack. I hope you are now armed with the knowledge to say with confidence you are seeing Cardinal Meadowhawks at your local pond or marsh. If you don't have Cardinal Meadowhawks where you live, maybe you'll be more adept at sorting out your Red-veineds from Saffron-wingeds. If you have another species complex you would like help sorting out, let me know and I'll see what I can do. Rock out with your hawks out!